Yeah, we've hit a record 10 days of over 105*F and no rain in site for the next 10 days or more. We did get a sprinkle last week and even seen some clouds but they weren't rain clouds. But I'm staying in as much as possible after the temperature hits 100*F and working at my desk or at various things. And since this is Wednesday I get to travel to locations all over the U.S. and Europe and visit desks!! Thanks to Julia at the Stamping Ground (who has been on vacation in Arizona and Utah) for bringing so many together! And she's been doing this for 422 weeks!!! I am preparing to hold an Open House to celebrate our new catalog from the company I'm an independent demonstrator (we're known as coaches) with. It's taking place on July 14 so I'm working on the Make 'N Take here. Far left is my paper trimmer in front of my Cricut, then sets of PanPastels in a media bag. Center is a "step out board" with pictures of the Make 'N Take step by step to make it easier for those making the cards. Then far right is my ATG adhesive gun (usually it's standing but it was in use), and finally my Amaze die cut machine. As to the back of the picture, stuff, Copic markers, ink pads, and more. 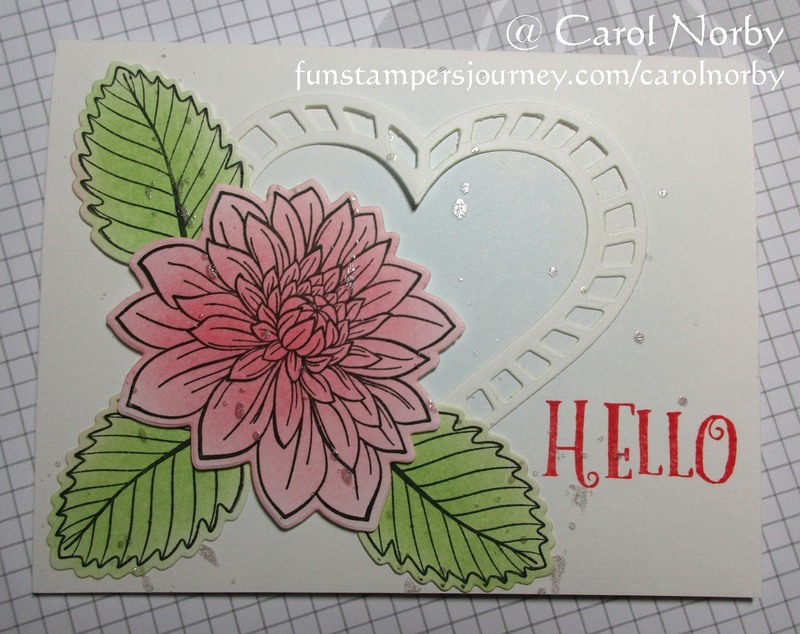 I used a new die and text stamp that will be available starting July 1. 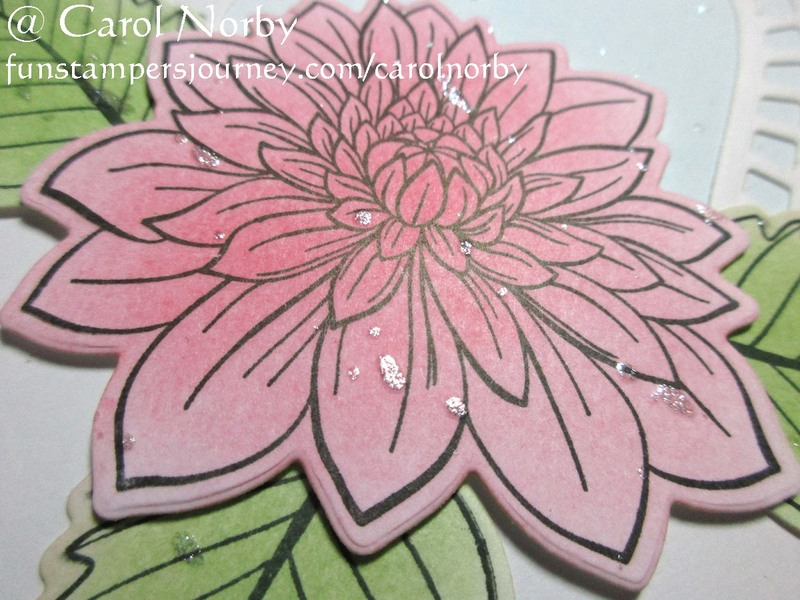 The Dahlia and leaves are hold overs from our soon retiring catalog but I really like this set. 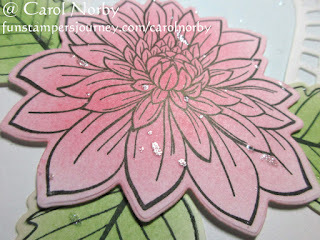 Here you can see the Sparkle Silk (kinda like a liquid glitter) that I just LOVE! I have 2 more bottles as the one I am using is now only half full. I've used the dickens out of it! Ok, I'm done. Please head over to the Stamping Ground for the links to many other desks and lots of great projects! I'll be around later as I have an exterminator coming by this morning to spray for those itty bitty ants as they're on my kitchen counters! And all over around the house. After 3 weeks of looking for them I finally called for help. My mums house is plagued with ants every year as are her neighbours. Not nice. Have a wonderful WOYWW Wednes-YAY!!! I wish I could send you some of our rain. I'm getting ready to build an ark! We have water in our backyard and in the ditch. The water level on the bay is high. I love the flower card. While you are baking hot, we are cold and wet here in the UK. We had a heatwave (at least, for us!) last week and now it's freezing again! At least we haven't got ants. Love the cards. Thank you for visiting - I'm glad you like my desk and the new kitty tree! We saw our new kittens for the first time yesterday and I've just blogged about them.